Fundraising is a big part of any charity. Every penny raised makes a massive difference, especially to birds needing veterinary care. There are many ways to get involved, why not take a look at some of our ideas below. We also have a Facebook fundraising page where you can bid on items in auctions, enter competitions and raffles. We understand some people worry about where money goes within charaties, so we have set up an ‘Amazon Wishlist’ so you can choose something for a bird within our care. Choose from food bowls, toys or a travel cage. We are open to suggestions to help raise money. So if you have any idea or want to get involved you can contact us via our contact page. Sign up to Easy Fundraising and select All Star Parrots as your chosen charity.Simply shop online and on the high street and raise donations FOR FREE. More details can be found on our Facebook Fundraising Page. Why not have a car boot sale. We can provide you with a donation pot and some informational posters to display. Do you own a business, or know somebody who does. It would be lovely to have one of our collection pots available for the public to make a donation. Pop over to our fundraising group on Facebook where we have items for sale, items to bid on or maybe you would like to donate an item. 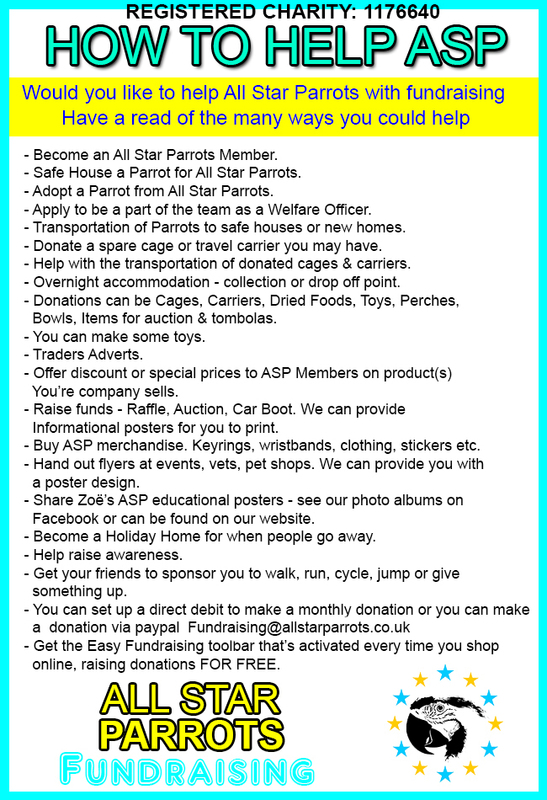 All star parrots fundraising is a key part of the charity. Do you have an item you would like to donate for the tombolas’ at events we attend. Do you have a spare cage or travel carrier. Many of the birds in our care come to us without cages.